Included in the small pile of Broyhill Sculptra documents a reader sent me was this sales letter from Broyhill Premier. It was probably sent out to Broyhill Sculptra dealers to encourage them to order more Broyhill Sculptra furniture, or to start carrying it if they're weren't already. In recent years modern designers have been paring away at the excesses in scale, weight and ornamentation in art, architecture, furniture design, and countless other related fields. A new reverence has developed for clean, uncluttered, but graceful lines which are functional and well proportioned. Designers and furniture craftsmen in the Scandinavian countries of Europe have undoubtedly thrust themselves into the forefront of this new "Puritanism." Their success has been evidenced by the fact that a great deal of the furniture produced in the past few decades which adheres to this principle has become known throughout the world as "Scandinavian Modern." Sculptra is an outstanding example of this "imported look" of Scandinavian Modern. It is master-crafted by Broyhill Premier in beautifully grained American walnut. Sculptured moulding bonded to the faces of doors present an outstanding principle design motif. Carved elliptical recessed drawer pulls contribute to the elegant simplicity. A curved stretcher between the gently tapered legs arches gracefully to support leg pieces. A unique moulded gallery rail sweeps upward from the top of many case pieces to add to the sculptured effect. The Brandy Walnut finish is achieved following a double bleaching operation which permits greater uniformity of color. Following the building of a rich color, hand glazing takes full advantage of the natural characteristics of each piece of walnut. Two top coats of lacquer are applied and the finish is hand rubber to a soft sheen. Face veneers are hand selected American walnut. Structural parts are of pecan and mahogany. Broy-Glide drawers operate on ball bearings and will not stick, drop down or fall out. All dining tables equipped with easy opening steel Broy-Slides. Drawer interiors are oak or mahogany, hand sanded and waxed for extra smoothness. Jewelry compartment included in each dresser. Buffets, chinas and serving carts have silver compartment lined and covered with tarnish resistent Pacific cloth. All beds with footboards equipped with wood rails. Terms: 2% - 30 days, Net 60 days, F.O.B. Factory. 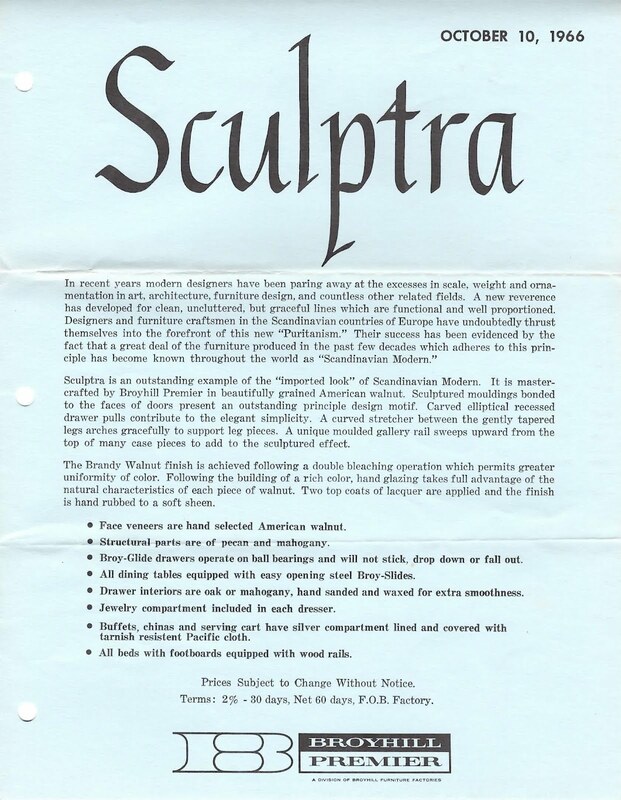 I love how Broyhill Primer starts by selling the general idea of modern design and mid-century modern furniture, or Scandinavian Modern as they call it, and then eventually get around to the details of the Sculptra line: the woods used, the branded names for slides and glides and the other selling points. How they describe Sculptra furniture in the second paragraph and the wording they use — elegant, simple, graceful, unique, sculptured —makes me want to buy every piece, sight unseen. I suppose that's the point of a sales letter that doesn't have any photographic or artistic accompaniment. 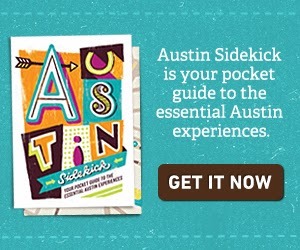 Gotta love who wrote this. 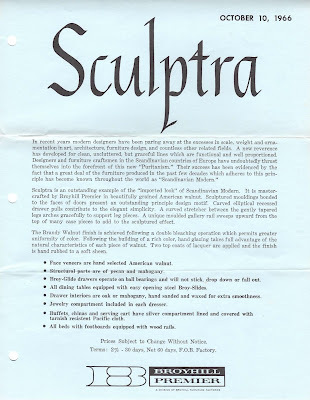 Sculptura, like Brasilia, is PECAN, NOT "brandy" "walnut" because REAL walnut with good grain was already was in short supply and going way up in price. Pecan is a beautifully grained wood, when stained properly it can look like walnut, but sometimes the grain goes very splotchy and crazy like no other wood. Also, Scupltra was the ONLY "Hawaiian modern" furniture line I've found so far. The surfboard pulls, the curved upward "outrigger canoe" leg supports, the tiki-esque moldings. Right out of Elvis' house in "Blue Hawaii". I love it. But no, Broyhill, "american" walnut is NOT pecan. And while danish-influenced, they just didn't want to label an entire furniture line after a two year movie fad. Hawaiian modern houses weren't made that long either. Too bad, they might have sold more had they been honest. OK, I see how they put it:"Face veneers"... yep, a tiny piece on each door is real walnut. The entire rest, pecan veneer. But that's exactly what makes Scupltra and Brasilia UNIQUE. I love it, wish they'd make 'em again.